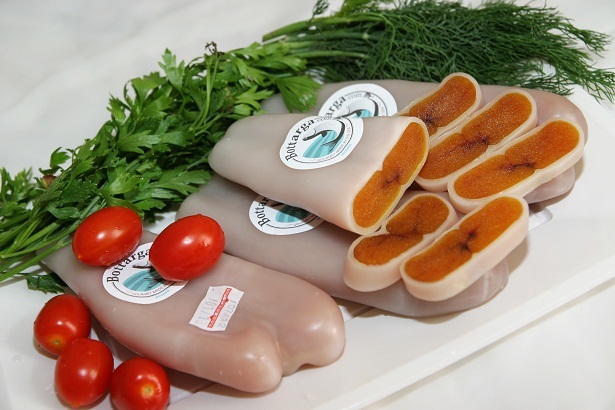 The Bottarga is a type of dried fish roe, which became popular in different countries and cultures. Let`s see some of the top cuisines. The Bottarga delicatessens, is actually dried fish roe, that where salted and covered with beeswax, in order for them to get the shape of a sausage. However, it is important to understand that the form of serving Bottarga dried fish roe around the world, varies between cultures. But how did it occur, that all around the world or at least in the most part, dried fish roe are being served at all? For that, we need to go back to their origin. The dried fish roe that compose the Bottarga, initially were roe of common fish in the Mediterranean, such as the Mullet and other fish. Today, incidentally, dried fish roe are being produced from ocean fish outside of the Mediterranean, but those that became common around the world, such as the Tuna. However, serving dried fish roe developed in several places in the world simultaneously. On the one hand, in Northern Africa and Arab countries, the Bottarga turned into a very cheap delicatessen, that won the nick name `the Caviar of the poor`. On the other hand, in the Greek Islands and in the southern parts of Italy, dried fish roe were being consumed in large quantities, particularly as side dishes. One of the ways to consume dried fish roe is without any additions. In that case there is a plate full of Bottarga dried fish roe. Each person can cut himself a slice, and simply eat it. Of course there is the possibility to combine the dried fish roe together with a Mediterranean alcoholic drink such as a small glass of Arak. Bottarga is a wonderful delicacy, that can accommodate those who are looking for a light snack on a hot summer day, when sitting on the balcony. This version of the Bottarga, is more common in the North African areas, where dried fish roe are consumed more freely. However, in the Southern part of Italy, it is customary to consume dried fish roe in a very different way. In the south of Italy, just like in the whole of Italy, the customary main dish is pasta. Because in the south of Italy it is easy and comfortable to fish and prepare dried fish roe, they very quickly became a popular addition to pasta. Today it is possible to find recipes for pasta with dried fish roe in different variations. Mainly with olive oil or butter, depends on the type of fish that was used for the dried fish roe. Of course there are many different variations, original and surprising, of delicious dried fish roe recipes’ all around the world. There are even recipes for special Bottarga butter or spreads, all around the world.